Russian President Vladimir Putin has raised the possibility of becoming a future prime minister by agreeing to enter the December parliamentary polls. Mr Putin, who must leave office as president next year, said suggestions he might seek to become Russian prime minister were "entirely realistic". 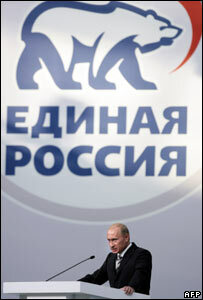 He said he accepted the proposal by the United Russia to head the party's list - without becoming a member. By being on the list he is guaranteed a seat in the next parliament. The BBC's Mike Sanders says Mr Putin's announcement comes as a shock, but is the clearest indication yet that he is determined to stay at the centre of power in Russia. According to the Russian constitution, he is not allowed to run for a third consecutive term as president in March. "As far as heading the government is concerned - this is a quite realistic suggestion but it is still too early to think about it," Mr Putin told the congress of the United Russia. Should Putin be Russian PM? "Two conditions must be met first - United Russia must win the election and a decent, capable and modern person with whom I work as a team should be elected as president," he added. His announcement follows years of speculation about what he might do after his last presidential term ends. Pro-Kremlin political analyst Gleb Pavlovsky described it as a radical change. "We can forget our favourite cliche that the president is tsar in Russia," Mr Pavlovsky told AFP news agency. "It's the most politically logical solution to the problem of what Putin does when he leaves office," he said. "It's hard to imagine Putin would become prime minister after being a super-popular president. The dual system is bad for Russia - Putin must be worried... he would not want to be junior to the president," he said. "For Putin to be the most senior figure, the constitution would have to be changed. And Putin has always made it clear he wants no changes to the constitution," he added.